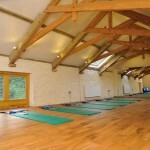 The Studio at the Hen House has been purpose built to create a warm, comfortable and tranquil atmosphere, which is perfect for Pilates and Yoga. Originally, a cattle barn, the Hen House has been beautifully converted to house 7 spacious treatment rooms downstairs and a counselling room and luxury studio upstairs. The Hen House is situated just outside of Kingsbridge, Devon off the Lodiswell road at Coombe Farm and offers plenty of parking.